IBM Tivoli Intelligent ThinkDynamic Orchestrator and IBM Tivoli Provisioning Manager help automate the provisioning and orchestration tasks by invoking pre-prepared workflows that perform most of the provisioning and orchestration tasks automatically. This frees up resources to focus on more productive issues, and helps allocate CPU capacity to where it is needed and when it is needed. Workflow and Automation Package management are the single most important success factor in any IBM Tivoli Intelligent ThinkDynamic Orchestrator and IBM Tivoli Provisioning Manager implementation. Understanding and mastering this issue is critical for Independent Software Vendors (ISV) who wish to allow their products to be an integrated part of any IBM Tivoli Intelligent ThinkDynamic Orchestrator and IBM Tivoli Provisioning Manager environment. 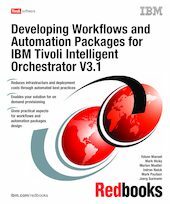 The primary goal of this IBM Redbooks publication is to support ISVs, Business Partners, Customers, and IBMers in developing and implementing Workflows and Automation Packages to be used for automation purposes by IBM Tivoli Intelligent ThinkDynamic Orchestrator and IBM Tivoli Provisioning Manager. This book is focused on effectively planning, developing, testing, and implementing product, device, or customer specific best practices into the IBM Tivoli Intelligent ThinkDynamic Orchestrator and IBM Tivoli Provisioning Manager engines, in order to automate management processes related to specific system and device implementations.